I saw this video where an egg was poached in the microwave. Tried it this morning. One minute was too long. The yolk was no longer runny. I did another egg for 50 seconds, but something weird happened and the white didn't cover the yolk. It looked uncooked and I tossed it. Started reading about cooking stovetop. Good grief! Why does something so basic have to be so complicated? What's the secret to a perfect poached egg? I just boil some water, stir it until I get a "whirlpool" and drop an egg into it. I usually crack the egg into a small bowl or custard cup so that pouring it is easier. Then I let it cook until it's done to my liking. Sometimes I do get little shreds of egg white, which can be trimmed for neatness if you care. I have never cared enough, LOL. use fresh eggs and the whites stay together better. I poach an egg in a small, deep frying pan. Spray the bottom of the pan first with Pam. Otherwise you will need to really scrub hard to remove egg residue. Then fill the pan with water to about a 1/2 inch from the top, add salt and bring to a boil. Reduce the boil to a nice, gentle boil, and break a FRESH egg into the pan and water. The cold egg will reduce the boil, and so bring it back up to the boil, but reduce the heat to a simmer. As it cooks, you might want to use your spatula to flip some of the water over the top of the egg yolk to cook the top of the yolk. Remove the egg with a spatula before the yolk is cooked through but the white is well set. Be sure to drain every drop possible off the egg and edge of the spatula before you use the dull side of a knife to slide the egg onto buttered toast. Add salt and pepper to taste. My favorite way to fix an egg. You will read cookbook directions to fill a deep sauce pan with salted water, bring it to a boil, stir a whirlpool into the center of the pan and pour an egg into that vortex. I don't bother with all that. 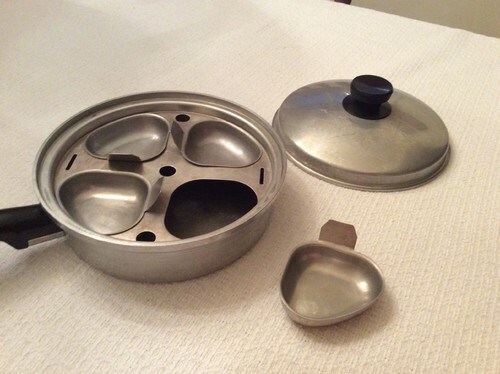 My mother had an egg poacher pan like this, (Her's made five at a time) but I do not like poached eggs, and so I've never made them myself. I did see Martha Stewart use the same method that Annie described, but I think Martha added some vinegar to the boiling water. I think that was to keep the eggs from combining with the water. I'm like Annie: I bring water to boil in a non-stick pan ( I like my mini wok ), drop the egg in and let it simmer to my liking. I don't acidulate (Lemon or Vinegar); it ruins the taste and my water is hard enough that I don't need it. Since it is impossible to buy really fresh eggs at the grocery and I have tried EVERY hint on Garden Web and on Google and they DO NOT work. I end up with a yolk with a small amount of white and a huge amount of strings! I use my vintage egg poacher with cups that was my parents. They taste fine, better than the traditional. The only difference is that they are not round, but oblong. It makes four at a time. I will try to add a picture later. ETA: I have simmered, rolling boil, salt, vinegar, standing on one foot and holding my right ear............. I cannot make it work. I'm smiling reading each of your comments. Same things I've read online. I may try the swirling vortex next go round. Maybe I can buy a few eggs from the lady down the street with a chicken coop or I'll grab them at the farmers' market. ETA: I have my mom's vintage Sunbeam egg cooker. I know at one time there was a poaching tray, but it must have been tossed before I got the cooker. I'm in in love with it. makes perfect poached, hardboiled and soft boiled eggs which peel easily and the omelettes are so good., like little souffles. I have bought it for each of my sons too. The secret to a perfectly poached egg is to go to the bother of perfectly poaching it. 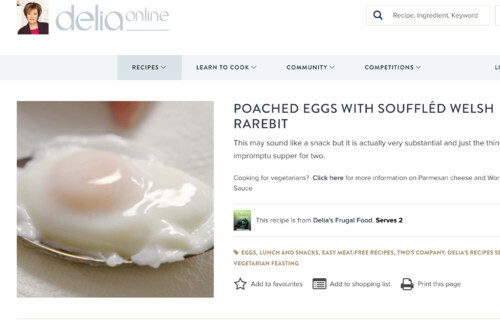 You can get a so-so poached egg using the microwave or water bath and an egg poaching dish. A perfectly poached egg is a round (no flat parts) sack of eggwhite, with no tails (those can be trimmed if necessary) holding a completely runny but cooked yolk. The water needs to be deeper than the egg, so it won't sit on the bottom of the pan, but any deeper is just for your convenience. The water should be salted or flavored not for the sake of the egg but so that any water clinging to the egg. Additionally, the water should have some acid--usually a spoon of vinegar--in it to help the white firm up fast and not float away. Too much vinegar can make the white tough, however. There shouldn't be so much vinegar that you can taste it. The vortex method also helps the white clump around the yolk rather than tailing off, but tails are also an indicator that the egg is on the older side (Annie grows her own--few have eggs that fresh). If you're planning on making poached eggs for company, it's worth buying new eggs, and if possibly locally grown ones that haven't been sitting around. I usually use a 1 quart saucepan for one or two eggs at a time. It's the perfect size. It's pretty darned easy to make a lovely poached egg by following the directions. If you just want it to magically appear, it's a lot harder. Fresher eggs definitely help, I have hot or miss success, higher success rate - but still not perfect - starting with sous vide. Waverley, that has a lot of good reviews and it's pretty cheap. I might be tempted to buy one. I have gotten used to making hard boiled by steaming which is basically what those appliances do. Pillog, I have tried and tried. Yours is one. It does not work for me. I tried them all the last time one of these threads started. I am not wasting any more eggs. This is mine. They taste exactly the same as the traditional method. I use a pan designed for the purpose....much like Sherry's above. Technically I know they are not exactly poached eggs....more like steamed eggs.....but they taste exactly the same and are infinitely easier to do than messing about wth a swirling pan of boiling, acidulated water !! If I was trying to impress someone with my culinary skills, I might try to perfect the water poaching technique but they are just for me and all I care about is convenience and taste. And the poaching pan offers that in spades! Sherry, it took me awhile to write my post (real life is such a bother!) and a lot came up between when I opened the thread and when I posted. It wasn't directed at anyone else's response. Whatever works for you is fine with me! The OP was asking about the microwave and I was thinking about those TV things that are supposed to poach in the MW. Interesting comments about the vinegar and water hardness and flavor. I have neutral water on the softer side of middle, and I never taste the vinegar, nor does it make the egg grainy, which I read somewhere. It makes sense that it would have an effect. I wonder how distilled water works for poaching eggs? For neater eggs, break it into a tea strainer, then then the really runny white will dip away, leaving the firmer white. DH just kind of drops the eggs into the boiling water and then scoops them up with a spatula and we've got poached eggs. They're nothing fancy looking not perfect at all but tastes delicious. My mother would put a saucer upside down in the pan with boiling water and then would crack the egg into the water. She used bit of vinegar. I could always taste the vinegar but other people said they couldn't. (I have thrown away all of my non-stick pans since I read that it impacts the size of a boy's nether parts if used from childhood on. Who knows if there's any impact on girls and women as well. Pillog, I wasn't upset. Sorry if I sounded like it. I got irritated last time at myself for not being able to do it. Our water is very hard. Maybe between that and supermarket eggs???? Islay. yep I tried the tea strainer thing also. I was left with hardly any white at all. Normally, I prefer fried or scrambled anyway. I just thought I should learn how. I almost forgot... during one of my episodes I discovered that an immersion blender makes a really good vortex! Also, for commercial eggs, I always check the Julian date rather than the best by date. That’s the packed on date. Still not a guaranteed indicator of age, but better. In the end, I’ve just resigned myself to the fact that there’ll always be some failures. But surely this thread will eventually set me on a manic quest to perfect my poaching technique. The eggs cook cook perfectly and are removed easily plus they are easy to clean. I rub a small amount of butter inside before cooking and cook for 6 mins. It's so easy to put about 4 inches of water into a sauce pan and when it boils, swirl with a spoon and break an egg into the vortex, turn off the heat, put the lid on thepan and wait 4 minutes....the smaller the pan the longer you need to wait as the water cools off faster. I use lemon in the water to acidulate...works well even if I don't have Hollandaise to put on top of the egg. To me that's lots easier than washing a pan and a little cup to steam the egg in. Lindac92, doesn't work for me. Tried about 2 dozen eggs various ways, just the last time a poached egg thread was started. I have accepted that I am a poached egg klutz, lol. I've never used the vortex method, but for those who say their whites are all strings, maybe you're boiling the water too hard? I just bring a few inches of water (ideally enough to cover the egg; if it turns out not, then I baste once or twice while it cooks) to more of a simmer than a hard boil and break the egg into it. I do get strings, but not the whole white of the egg, just a few, easily trimmed if it matters. ETA I do get some cooked on egg on the pan bottom, but it's not hard to deal with. Oh, and until recently I've only ever had access to ancient supermarket eggs. Remove egg from shell, without breaking yolk, and strain the liquid-er part of the white out through a slotted spoon (one with more fine holes than some). Save the bulk of the white, and of course, the yolk. Place up to two or three eggs after so drained into a small bowl. Heat up a small amount of water (say about 2 or 3 inches deep, to a simmer... not a full boil, but a simmer where you just see water making bubbles. Make sure your water temperature will maintain this behavior, and not turn into a real boil or something before proceeding. Swirl the water gently with a spoon. Gently slide these de-shelled eggs into the water. Allow to simmer at that same temperature for 4-6 minutes (depending on preferred done-ness), then use the slotted spoon to collect them. I deposit them on a paper towel on a plate, then after they drain a few seconds, I upend them onto whatever I'm planning to serve them on. And I serve. I grew up eating poached eggs cooked in an egg poacher like Sherry posted, but since I just cook one at a time now I use a small pyrex custard cup, put some butter in it with the egg, put in a small saucepan that has water in the bottom. Add the pan lid and heat until it's done how I like - firm white, soft yolk. Technically, this is probably a coddled egg, but I've never had any luck with the water swirl method and dislike drippy with water eggs. I use this poacher and it works very well. https://www.surlatable.com/product/PRO-110767/Demeyere+Stainless+Egg+Poaching+Pan A little more expensive that some others, but if you use it enough, it's worth it. Not sure it will ever be as good as the real deal poached eggs in water, but it's close enough for me, and a lot less fussy. Before I order the Elite cooker I'll try the vortex technique. Don't care for poached eggs unless they are exactly like that. So So many failures in my lifetime to turn me off them. Buy two dozen fresh eggs...as fresh as you can get. I did that a few years ago and spent a day trying soft boiled, hard boiled steamed, (for deviled eggs)...did poached and other favorites, etc. Most will tell me how bad this is for me...... but I like to live on the wild side. I love poached eggs and have tried every single technique without success. Until this one.....learned right here years ago...and yes I know. Slather a piece of saran wrap with butter or marg or cooking spray. Place it in a small ramekin. Crack the egg into the dish. Twirl the top of the saran wrap closed. Place the pouch in a sauce pan of gently boilng water until the whites are slightly firmed . Let loose from the saran wrap and simmer until it is to your liking. Always had issues with poached eggs until I used a little bit of vinegar in the water. Make mine exactly like Sleevendog's video above, never fails, and I know our eggs aren't very fresh. That bit of vinegar is key for me. Okay, I've been craving a poached egg since this thread started and AnnT's picture pushed me over the edge. I looked at Sleevendog's linked video and decided to try the often failed water vortex method (which I gave up on many years ago). I did exactly as he instructed and I just cooked the most perfect poached egg. Perfect! Thank you all for your inspiration. I am so happy to know how to do it now. I think the last time I tried it was before internet cooking videos and the cookbook descriptions must have been lacking for me. I never saw anyone make one in person, so the video was the trick for me. One of the nice fringe benefits of recently having acquired a Miele combination steam oven is the ability to do absolutely amazing things with eggs. I am working on perfecting my poached egg recipe. It's already much better than anything I have ever manage to either make myself in a pot of water or eat in a restaurant. But I think I can fine-tune the cooking parameters even more. It's clearly a game of carefully twiddling with very precise temperature profiles and cooking times. Even just adding one extra degree Fahrenheit can radically alter the outcome. When done the way I like it, it results in a perfectly cooked soft yolk and in a great soft white. That's the part that always eluded me in the past. Soft but fully cooked (i.e. not just runny and raw) is so difficult to do the traditional way. I steam cook the egg in the shell. When it's done, I crack the shell carefully and out comes a perfectly cooked and oh so delicious egg. If the Miele CSO wasn't so expensive, I'd tell everybody that they should buy one just to make eggs. They are that good! Watched video five times. Used egg just bought. Followed instruction EXACTLY. Egg stuck to bottom of pan. I need to quit reading these threads and just surrender. I made the English muffins on another thread and they turned out perfect. (Thanks DawninCal!) Made Julia Child's hollandaise sauce, perfect! I hadn't made either before. I can't count the number of eggs that I have sacrificed to try to poach in water! Sherry, I'm not trying to be flip, but the problem is that the egg shouldn't sit on the bottom! The whole point of the pot of water is to keep the egg up. I don't know if fresher eggs are loftier, or if my water is deeper or if it's the hard vs. not hard water or the temperature (which most people successfully estimate by the bubble action, but does matter) or if I'm worrying the water enough to keep it from sinking, but the anti-gravity thing is the best part of poaching eggs! I think you're right that it's time to go back to making eggs the way you find comes out well. Maybe visit someone who successfully poaches eggs and do it together until you get the hang of it, and then see if you can reproduce them at home, if you just want to check it off your list of things to learn. Sherry, as I've said in a prior thread, I just break my egg into an enameled pan, add a little hot water, put on the lid and let it steam, I seldom go to the trouble of boiling water and poaching an egg as I see little difference in taste or texture, especially after you cover it with hollandaise. And I know it's heresy, but I don't even like Eggs Benedict because I don't care for the hollandaise sauce. There are several things that I've just never gotten right, in spite of numerous attempts. Molten lava cakes and 100% whole wheat bread from my own flour come immediately to mind. I ALWAYS overcook the lava cakes and if I grind my own flour and make bread, the final product makes a slice that is much like attempting to toast a doorstop. I finally decided that I really didn't care enough to spend any more time or ingredients doing that. After a certain number of failures it becomes too wasteful for me to justify. Annie, do you freeze your lava cake filling? I haven't tried it, but I saw someone do that on TV and it sounded like a good idea. Like I mentioned above, when it works do it exactly the same...same pot, same amount of water....all our stovetops are different, just like our ovens. If your pot is thin bottomed or the burner you choose is too shallow or too broad ? (the flame...gas) the electric coil,?, might make a difference. As well as the chosen pot. That is what is so freaking funny! I’ve never had one sink either! We normally just eat fried with no oil, which looks like a flat poached egg, or scrambled. I can’t tell any difference in taste between our fried or poached, since we cook slow and don’t let the white get crispy. I will just use my pan or do like you suggested Annie and add a little water to our fried. Sleevendog, thanks for the video! I followed it and like Olychick found the result was an almost perfect poached egg. I cooked it for 3 minutes, but will reduce that just a bit the next time. When I find fresh eggs at the farmers' market I'll grab some just to see if there is a difference. Okay, I looked at the video, finally. The cook is lovely and approachable, demonstrates well and doesn't add extra thoughts or fuss. Nice. Catticus, in the video, his egg is a little overcooked too. ;) I was wondering how he was able to handle it, after it was set, so much with his fingers without squashing it. In a really really perfect poached egg, at least as far as I'm concerned, the white is a completely cooked but not rigid sack holding a completely runny yolk without solid cooked yellow. I didn't manipulate the egg once out of the water. It actually looked pretty good as it came out. No wispy bits. Was just a tad too done for my taste. The yolk was runny, but not completely. Sorry. I'm short on sleep. I just meant, since you said you'd cook yours less next time, that, in the video, his "perfect" three minute egg was a little overcooked, too. As in you did it just like he said, but I got why you wanted to make it a tad less done. Who cares. We likes what we like. The extra 30 seconds is what I want. Maybe to some that looks great. But I prefer the flavor of a fully cooked white, ...and again, the confirmation of the tiny bit of yolk a bit firm that does add another flavor element. The rest runny....no runny white with my yolk! Sleevendog, I didn't mean to criticize the video, which has helped two of our number to egg poaching success, or your posting of it. Again, apologies for my lack of proper nuance. I've never had runny white on a poached egg, even with no solid yolk, so I was just trying to agree with Catticus, not make a big brouhaha over the best time or temp for the egg. If you like yours a little more solid that's fine with me!! What do you mean by runny? What do you mean by firm/solid? How old is the egg? How cold/warm is the egg before cooking? What breed of chicken laid the egg? Is the chicken free ranged? What kind of diet the chicken eats? How old is the chicken? How was the egg stored? How cold/warm is your kitchen? What kind of pot for poaching? How much water in the pot? what do you put in the water? Salt? Vinegar? What is the water starting temperature? What is the water temperature when you drop the egg in? How fast do you stir the water? How many eggs in the water? How long do you poach the egg? How soon do you eat the egg after it comes out of the water? Sorry, but there is no way in hell I am going to run through a list of 21 different variables to cook a "perfect" poached egg!! And I don't care a whit if most consider it a 'steamed' (NOT poached) egg - I will stick with my purpose-designed poaching pan. Perfectly cooked eggs every time with absolutely minimal effort and thought!! Eggxactly! There is no meaning in arguing about “my way is way better than your way”. Tried again this morning. Called it done at 2 minutes, but there was the slightest wiggle of white. Not what I want either. Everything has been edible and I'm enjoying the process, so no big deal. Bbstx, I was thinking about your post that a temperature controlled bath would be ideal, especially if you're making a whole bunch, because when I've read about the science, it says that the right temperature is important (though most people achieve it without measuring just by making it normally), but my first thought, before that, was eggs under vacuum? (sous vide) Dear Kenji L-A, after my own heart, says, "using a temperature-controlled water bath". The nice thing about the silicone cups that were pictured up topic is that they're round on the bottom so you still get the nice snowball shape. BTW, for less than ideally chicken fresh eggs, using the vortex method, you can keep your spoon turning the water and sort of encourage the white into place around the yolk, if it doesn't form a perfect nebula like in the video. Sous-vide eggs are definitely a thing. If you have never tried one, prepare to have your mind blown. The downside is that they take quite a while to make. Traditionally, sous-vide eggs would be cooked at about 145°F for one hour. Afterwards, you can refrigerate them and gently heat up when you want to serve them. An alternative method is increasing the temperature by up to about 20°F and significantly reducing cooking times. You can get cooking times on the order of between 10 and 15min. That's a lot more practical, if your intention was to eat the eggs right away. This subtly changes the results. The yolk with still be just as creamy soft, but the whites set just a little more. IMHO, this is actually quite nice. But some people prefer the more traditional sous-vide style. I guess, you have to try both and decide for yourself. There is one important thing to consider though. With the traditional method, it is relatively safe to leave the eggs at temperature for a longer time. So, you don't need to watch them like a hawk. If you crank up the cooking temperature, you better watch the time carefully. Wait a few minutes too long and your wonderful poached egg turns into a boring old soft-boiled egg. Still perfectly edible, but it won't blow you away with it's delicious soft- and creaminess. While I linked a recipe for how to use the faster method with a sous-vide immersion heater, I am personally trying to use a Miele CSO instead. There are advantages to doing this, as it is in some ways a more controlled environment (i.e. all Miele CSO heat at the same rate and have the same heat retention). I am still tweaking cooking parameters just a little bit. But I think I am close to having great results and a relatively short cooking time. Very fresh eggs (mine were two days old). Heat water to a simmer... little bubbles and that was it. Check to see if the simmer maintains, and remember where that is on your cooktop dial. (For future poached eggs). Swirl the water with a spoon or something. Slip eggs in, allow to do what they gotta do. Cook 4 - 6 minutes depending on your level of doneness. I like whites solid, the edges of the yolk gaining substance, while the interior is liquid or creamy (depending on purpose - to add to ramen I like yolks more creamier than liquid, for any other purpose I'm happy with less done). Using a slotted spoon, pull them out and place on a paper towel to wick any extra water off. I usually don't bother trimming trailing edges of egg white (this is not a restaurant! ), but the fresher your eggs are, the less trailing there will be, anyway. Plop onto your serving dish (whether into ramen, or onto English muffins a la Eggs Benedict, or onto whatever you want to eat them on). Dad once gave me one of those poached egg skillets, which would make 6 eggs at a time, but the Teflon-style coating soon came off and I had to discard this. Ironically, I bothered to clean out the place where my (it was my mother's) egg poacher resides, decided to clean it up too (and put it back together? ), but it's missing the cups. Where in the heck would the cups be that the pan isn't? I kept thinking, why don't I use this thing more. Now I see everyone else does and I want poached eggs. Ann, will you come visit me and make me some so they're made right? Just to add fuel to the fire, how about sous vide poached eggs? SousVide eggs and steam oven eggs are pretty prefect. I've used that method with great success. just doesn't always fit a Sunday morning 'timing'. Me? My perfect egg is rustic country BrazilianVarigated. So simple. I have no issues with different methods, even microwave if it works fast and easy...it is just an egg. Complicated is for those of us that want the experience to take the method one step to perfection. @bbstx First off, thank you for this, as I learned I can now pasteurize my eggs with my sous vide, and now my pregnant wife can enjoy the runny eggs that she's been craving. Someone's going to be a hero tonight. But, it seems that getting "my" ideal poached egg with sous vide alone seems to be fairly difficult. I prefer a slightly firmer white, with a runny yolk. To get the perfect yolk, to me I find the white is too loose. And getting the perfect white results in almost a soft boiled yolk. I did see a video of someone who cooked the perfect yolk, and then flash simmered the egg for a minute to firm up the white. Though if I'm going through all that trouble, it's just easier to make them in a pot of water or the egg poacher unless I'm making it for several people at a time. This is a good way to get a soft yolk with a slightly firmer white. Just be careful to watch timing. Unlike traditional sous-vide cooking, precise timing really matters here. Steve J, I noticed that reading Serious Eats... not easy to get the white and the yolk to both the right stage I'd want, using sous vide. So... I'm happy doing it the old fashioned way. But if pasteurization is needed, I can see this the way to go. M have you tweaked making a poached egg in the miele combi oven? I tried it following the chefsteps (sous vide) and it came out uncooked. Then I tried another egg on master chef set at "medium" which was better but too firm.Happy to get some of your pro advice. I have had pretty good luck with my Miele CSO, if I set it to 10min at 165°F, followed by 1min of 170°F. I feel that it isn't quite perfect yet. But it's pretty close to what I want from my eggs, which minimizing the total overall cooking time. I suspect that it is possible to make cooking time even shorter. Maybe try something like 7min at 165°F followed by 2min of 168°F? But that's just a guess. I am not eating enough eggs to play through all the possible permutations. And it's definitely something that takes trial and error to dial it in correctly. Also, I am sure that even if it works great in a Miele, if you had a different CSO, then the recipe would probably be different, too. Thanks M ! I have the Miele as well.Are you doing the 10 minutes/ 165 as sous vide? It would be good to have a Miele combi steam recipe thread. I would love more info from users. 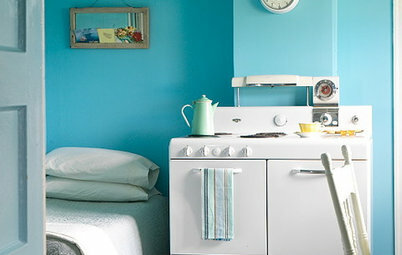 Color Robin's Egg Blue — Oh, What a Hue! 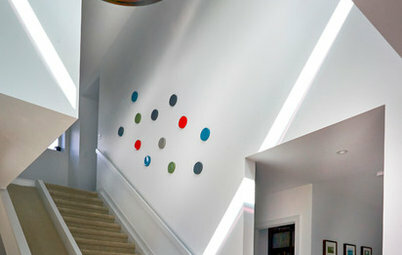 Fun Houzz Upload of the Day: Last One Down the Indoor Slide Is a Rotten Egg!